In a fit of anger Queen Ravenna turns in to hundreds of Ravens every time the enchanted mirror rejects her as being the fairest of them all. 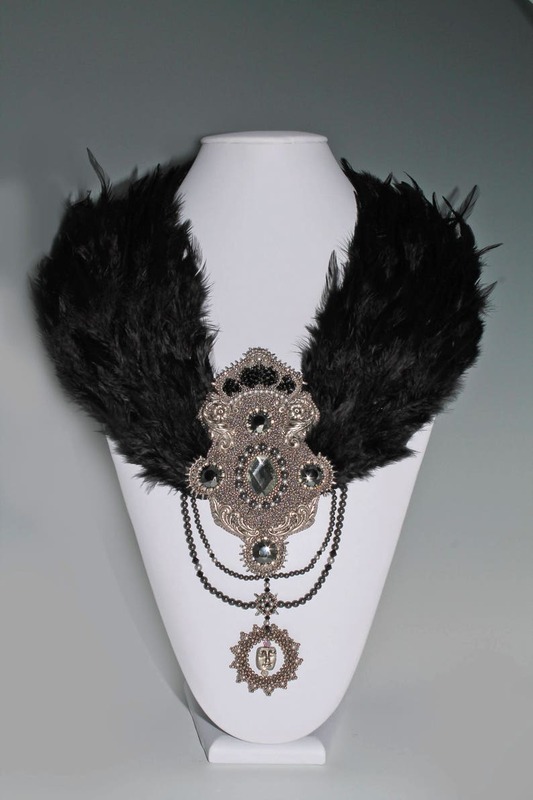 This gorgeous, one of a kind piece is my interpretation of Snow White and the Huntsman. The centerpiece is hand embroidered with silver glass seed beads, Swarovski crystals and filigree. Swags of Swarovski pearls hold the face in the mirror. The collar around the neck is rows of black feathers lined with Ultra suede for comfort. The beautiful clasps a graceful net of Swarovski peals with more pearls draped down the back for that sultry look. This piece would make a statement with a strapless black dress.